Sean Caruana Webster, 29, is currently working on a series of fairy tale books in Maltese called Stejjer Imsaħħra (Enchanted stories). Sbejħa u l-Bhima (Beauty and the Beast) is the first fairy tale to be published. Born and bred in Żurrieq, Webster, who participated and won a special prize in the Konkors Letteratura għaż-Żgħażagħ in 2013, tells Melisande Aquilina what it means for him to get lost in the world of fairy tales. How does the medium of the fairy tale inspire you as a person? Fairy tales have always been labelled as stories for children, simply because of the magic they involve, and because most main characters are royals. Disney took these tales and sugar-coated them further to reach the younger gene­rations, but when you read the original version, most stories show the pain and sacrifice endured in order to reach the ‘happily ever after’ ending, which is a more realistic mentality and one I hold to. Your rendition of this iconic tale is different from the one usually portrayed in most children’s books ‒ can you tell us how and why? Most people tend to look at versions of these tales as they have been transformed by big capitalist companies that ‘make use’ of children and their desire for products such as dolls and stationery related to that version of the story. My project aims at re-introducing the original concepts. Many may find these tales darker than usual; but that is because we are more used to the little children’s versions, which are less realistic. I derived my actual inspiration from the first revised version of the popular tale, written by Jeanne-Marie Leprince de Beaumont and published in 1756. Why a fairy tale specifically in Maltese in a market that is perhaps more English-language oriented? Is it because you believe the Maltese language is in danger of losing its importance? I did not base my project out of fear of my mother-tongue dimi­nishing; that is an opinion I have, but one not related to this story or the following in the series. 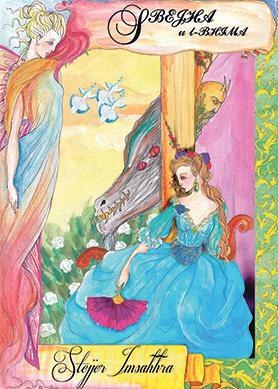 I wrote this translation in Maltese be­cause I want to give Maltese fairy tale lovers something I could not find myself – the original story in Maltese, from a Maltese, to the Maltese. True, one may find various books of fairy tales in Maltese, but these are usually converted from the Walt Disney or other usual children’s versions which have already been used and re-used countless times. What is the method you used to create the book from scratch? First came the words, then the illustrations. At first I believed that doing the translation first would be the hardest part and I wanted to get this over and done with. However, as I began to illustrate, I found that the translation was actually the easy part! I spent a week focusing on the writing and about two months on the illustrations, as I kept changing these around until I was happy with the design. All in all, it took approximately four months for the books to be designed and finalised. How many sketches and how much time does it generally take before you arrive at the final version? It depends on my mood and how fertile my imagination is at the time. It might take me 20 minutes to get one picture done, and then it could take me three days to get the next one just right. I tend to become quite a perfectionist when it comes to the visual part of creating the book. Which kind of colours do you use? Do you draw freehand or use other means, such as computer software? My main colouring tools are pencils, felt-pens and watercolours. I draw all backgrounds and figures freehand, but I make use of software to join them into a complete picture. Do you base the characters you draw on fantasy, personal experience, real-life people or something else? The characters I make up come all from my head. I give them characteristics such as eye and hair colour preferably different from the more popular version of the same character to try and deviate as much as I can from the conventional and traditional, but still within reason. When a particular character has his or her characteristics specifically mentioned, changing any part of that is a definite no-no! I would never draw a blonde Snow White or a brunette Rapunzel! There were those who des­cribed your renditions of the tale as being too disturbing for young children – what is your reaction to this comment and in what way do you think they found them ‘disturbing’? Yes, I have heard this being said. This proves my point about how people are much more aware of the sugar-coated versions. My reaction to such comments is simply to say that I did not create this series to give another version of the same, but to reintroduce the original concepts. Twisting or softening the stories in any way would compromise my goal. Then again, I do not exaggerate or overdo any particular ‘darkness’ in my stories, unless needed to show the reader how truly frightening a character or situation is described. Stejjer Imsaħħra was des-cribed as being the first book in a series – how many other books do you think the series will contain? Can you tell us what the next book in the series will be, and when it will be available? My aim is to produce a further 26 titles together with my publisher Joseph Sultana and his publishing company Vision Plus. I produced this one first because I wished its publication to coincide with the upcoming live-action Disney movie starring popular actress Emma Watson, which incidentally will be out next March. I plan on publishing my next title next summer. I don’t wish to say directly what the next title will be, but let’s just say it will be coming out in summer be­cause it has something to do with the sea! Sbejħa u l-Bhima, pub­­lished by Vision Plus, is available on­line at www.visionplus.org.